The Alumnae Achievement Award recognizes an alumna who personifies the value of a liberal arts education and who has brought honor to herself and to the College through her outstanding accomplishments. Recipients must have been out of college for at least 10 years. If you would like to nominate an alum for this award, please fill out the Nomination Form and mail it to: Alumnae Achievement Award Nominations, Randolph College, 2500 Rivermont Ave, Lynchburg, VA 24503. During the 2018 Reunion, Randolph College recognized Dorothy Braden Bruce ’42 with the Alumnae Achievement Award. She was part of the Army Signal Intelligence Service’s cryptology program, and worked to decode intercepted messages about troop deployments and supply ships from the Japanese navy. The information supplied by Bruce and the other codebreakers helped the U.S. Navy pinpoint and sink almost every supply ship heading to the Philippines or the South Pacific. On Saturday, September 16, 2017, Randolph College presented Alumnae Achievement Awards to two outstanding graduates, Carla Alexander ’68 and Lucy Williams Hooper ’73. Also during the ceremony, Randolph named Skip Kughn an honorary alumnus for his many years of service to the College. Muriel started her dedicated, three-decade long career at R-MWC in 1972 when she was hired as alumnae director. She retired in 2003 as the director of the R-MWC Alumnae Association. Muriel’s volunteer service to the community include a member of the Council for Advancement and Support of Education in Washington D.C., an active member at Trinity Episcopal Church in Lynchburg, a board director for the Lynchburg Mental Health Association, a board director for the Woman’s Club of Lynchburg, and an active member for the American Association of University Women and the Daughters of the American Revolution. Muriel is an invaluable icon in both the Randolph and Lynchburg communities. Rebecca has spent over 50 remarkable years in higher education. Her service to Randolph College includes her time on the Board of Trustees from 2003 until 2013 with a short hiatus from the Board in the spring of 2007 to help guide the College’s Admissions Department through the enrollment of its first co-educational class. Rebecca continues to be involved in her community by volunteering as a docent for the Chicago Architecture Foundation where she leads boat and walking tours of downtown Chicago, as well as being an active volunteer at the Fourth Presbyterian Church in Chicago. Known for her expertise in international education, university admissions, financial aid, registration, records, and university program review, Rebecca has truly lived the life more abundant. Heather spent over 30 years at Randolph College working first in the summer programs department before moving to the alumnae office to work with Muriel Casey. 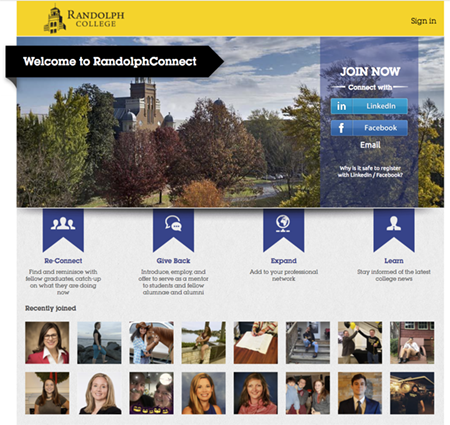 Heather helped Randolph College through the transition to co-education as the director of alumnae and alumni. She has worked with many offices on campus, including Development, Admissions, and the Career Development Center. Throughout the strategic planning process, Heather has served as an ambassador for the College with alumnae across the country. Carol is a nationally known opera singer and music educator. Making her opera debut in 1980 in the New York City Opera’s production of The Love for Three Oranges, she went on to perform with numerous opera companies including the Lyric Opera of Chicago and the Opera Company of Boston. Her extensive repertoire includes roles in such classic masterpieces as La Traviata, La Boheme, and I Pagliacci, as well as premiering new works including Dominick Argento’s Casanova and Philip Glass’ The Civil Wars. Carol earned her master’s degree from the Northwestern University School of Music. She was an associate professor of music at McGill University and at Randolph-Macon Woman’s College and is today a vocal teacher and director. Edna graduated from R-MWC in 1977, and earned her master’s and Ph.D. in Spanish American literature and language from the University of Texas at Austin. She is fluent in both English and Spanish and continues to teach today. She is currently the assistant vice president for academic affairs for the Texas State University Round Rock Campus. She has spent much of her career dedicated to Texas State’s Round Rock Campus, which has grown from just 100 students in 1998 to more than 2,000 today. These students are mostly non-traditional students, who work full time and attend classes in the evening. She has helped build the institution from a brand new campus of portable buildings to a full-fledged program serving a worthy constituent base. Kakenya is the founder and president of the non-profit Kakenya’s Dream and the Kakenya Center for Excellence, a boarding school for girls in her hometown. KCE is the first primary school for girls in Enoosaen. The main focus of both the organization and the school is to uphold the human rights of girls. She believes that education will empower and motivate young girls to become agents of change in their community and country. On Saturday, September 20, 2014 President Bateman presented Ann Close ’56, Ellen Suthers ’73, and Gonul Velicelebi ’73 the Alumnae Achievement Award. The three alumnae were recognized for their outstanding service and accomplishments. On Saturday, September 20, Jolley Bruce Christman and Minor Michel Shaw, both class of 1969, received the Alumnae Achievement Award. The past president of the Board of Trustees, Trustee emerita Jolley Bruce Christman, is a leader, author, and educator recognized for her work in urban education. After graduating from R-MWC, Jolley taught English and social studies in an alternative high school while participating in the Experimental Program in Urban Education in Philadelphia. After completing her doctorate, Jolley worked for the School District of Philadelphia in the Office of Planning and Research. She also taught a course in qualitative research at her alma mater, the Graduate School of Education at the University of Pennsylvania. In 1992, she co-founded Research for Action, a nonprofit organization engaged in education research and evaluation in urban school districts nationwide. Minor is a noted businesswoman, philanthropist, and civic leader. She began her education at R-MWC and received her bachelor’s degree from the University of North Carolina, Chapel Hill. She has received honorary doctorates from Clemson University, Wofford College, and Furman University. The president of Micco, LLC, a private investment company, Minor has previously served as president of both the Micco Corporation and the Mickel Investment Group, as well as the chairwoman of the Daniel-Mickel Foundation. Minor has been extremely active in her community, and received many honors and awards including the Whitney Young Humanitarian Award from the Urban League of the Upstate, the Athena Leadership Award, the Wilkins Award for Excellence in Civic Leadership, and the Order of the Palmetto, which is the highest civilian award in the state of South Carolina. On Saturday, September 15, we celebrated the accomplishments of Lynn Hume Stuart ’60 and Lois Combs Weinberg ’65 at the annual Alumnae Achievement Awards. For four decades, Lynn Hume Stuart ’60 has contributed her time and talents in service to R-MWC, Randolph College, and the Lynchburg community. She has served as a leader in the Alumnae and Alumni Association and as a docent at the Maier Museum of Art. As a College trustee for 10 years, she focused on buildings and grounds projects and coordinated the development of the College’s Facilities Master Plan. A history major with a knack for thorough research and conscientious organization, Lynn owned and operated a tour and travel company for 11 years with another Lynchburg alumna. Lynn is a tireless and thoughtful volunteer who, through her passion for community outreach, art, architecture, and travel, has touched many with her gifts as a facilitator and leader. Lois Combs Weinberg ’65 is devoted to community action. She has spent 30 years tutoring children with learning differences and advocating for the parents and students. Beginning with an after school program, she recognized a broader need, garnered financial and legislative support, and founded a full-time school for dyslexics which operated for 19 years and served six counties in eastern Kentucky. Currently, she is director of a non-profit institute that helps school teachers and administrators identify and remediate struggling learners with dyslexic characteristics. The College honored Dot Orgill Kirsh ’55 and Rie Meriwether Godsey ’77 as the 2011 Alumnae Achievement Award recipients on Saturday, September 17th. For decades Dot Orgill Kirsh ’55 has volunteered, supported, and recruited others so that the fine arts and culture flourish in Memphis. She has been a docent animal presenter at the Memphis Zoo for over 10 years, working on zoo camps and education sessions for underprivileged youth, accompanying student groups, and teaching others as she cares for zoo animals. She uses her persuasive talents to bring professional dance companies to Memphis to enliven the theatre scene. Dorothy has made a difference in her community by using her liberal arts education and philanthropy as her lens on the world. An economics major first intent on a career in banking, Rie Meriwether Godsey ’77applied her love of serving others and followed her entrepreneurial intuition to found Meriwether Godsey, a residential school dining service and catering company in 1985. Her philosophy on food service–think of every meal like a catered event–has differentiated her company significantly from others in the industry so that it now services 30 locations employing over 500 people in Virginia, the District of Columbia, Maryland, North Carolina, and Pennsylvannia with creative, wholesome menus, often influenced by locally-grown and seasonal foods. Alumnae from several decades, faculty, and over 70 students attended the awards presentation held on Saturday, September 11, 2010 to honor Suzanne Savedge Wescoat ’64 and Kathy Brown ’76. Randolph College recognized two outstanding alumnae on Saturday, September 19, 2009, with the Alumnae Achievement Awards. Meg Green Maguire ’65 was recognized for her leadership in preservation and conservation of the natural and built environments. Her reflections, titled “Community in Place“, she encouraged the Randolph students and faculty to engage in their community, wherever that may be–on campus, in their neighborhood or in the larger region, paying attention to the small details. In a presentation held on September 20 in Smith Hall Theatre, Renie Ferguson Steves ’58, an international culinary consultant, and Laura Geisel Sullivan ’74, a pathologist and hematologist, were each awarded the 2008 Alumnae Achievement Award. Introductions were given by President John Klein, followed by gracious remarks by both of the recipients. The Awards were presented Saturday, September 16, 2006. Alumnae recognized were: Betsy Kerr Hay ’65 and Marcia Y. Riggs ’80, and Virginia Muller Shapard ’57 . Alumnae, students, faculty, and community members convened to witness the 2005 Alumnae Achievement Awards ceremony in Smith Hall Theatre September 17. Honored were Susan Kelly Blue-Zeig ’66 , Kathy Morland Hammitt ’74 , and Virginia “Ginger” Hill Worden ’69.